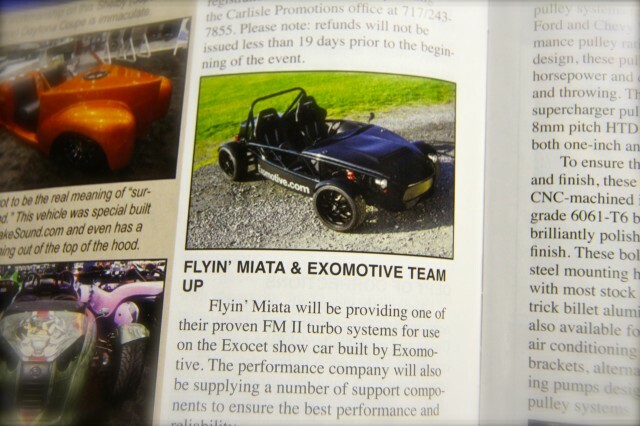 Exomotive - US Manufacturer of Exocars & Kit Cars | Exomotive teams up with Flyin’ Miata! Exomotive teams up with Flyin’ Miata! Exomotive teams up with Flyin’ Miata! We will be providing FM a new 2013 Exocet Sport to be used as a base for further development of performance parts for our Exocet platform. We will also be installing a complete, top-of-the-line FMII turbo kit on our 2013 demonstrator. FM is also planning to become an Exocet dealer so they can supply kits, parts and even turn-key cars for their established customer base. More good news for exocar enthusiasts in the US!